Microsoft General Manager says Lumia 640 amongst first to be upgraded to Windows 10 Mobile. I'm actually not sure if this is good news. I consider the Lumia 640 as an elegant swan's song for the Windows Phone 8.1 platform, I have no need for Windows 10 to bulldoze that anytime soon. The 640 sports the carefully designed and matured UI and stability of WP 8.1 with the welcome new additions of Update 2. The performance is amazing and it lacks all the retarded bugs that 8.1 introduced for older devices like the infamous audio popping, Start screen stuttering and empty tiles. Judging from the preview, Windows 10 Mobile needs at least another year to become stable, consistent and, quite franky, usable at all. shan678, prasath1234, xandros9 and 1 others like this. cincykid76, Guytronic, JohnStrk and 1 others like this. Lmao. I'm pretty sure a couple of countries that barely have the internet beat us to getting this phone. The hell is that all about?! We could always grab the 640 LTE ver. from Expansys, but with T-Mobile pricing it at $89, I'd be a fool to pay $219.99. So here's a question. Will it be possible to avoid the "upgrade" to W10 on our Lumias? I never like to purchase or switch to any important software until it has had the major bugs worked out, which always seems to take at least 6-12 months. I believe as long as you don't let it download the update/ignore the update prompts you'll be OK for some time. There was a WC article on it, it was later updated that the page was taken down. Its not fake as it did show as Coming Soon for 89$ before it was pulled. Probably added to the site prematurely. 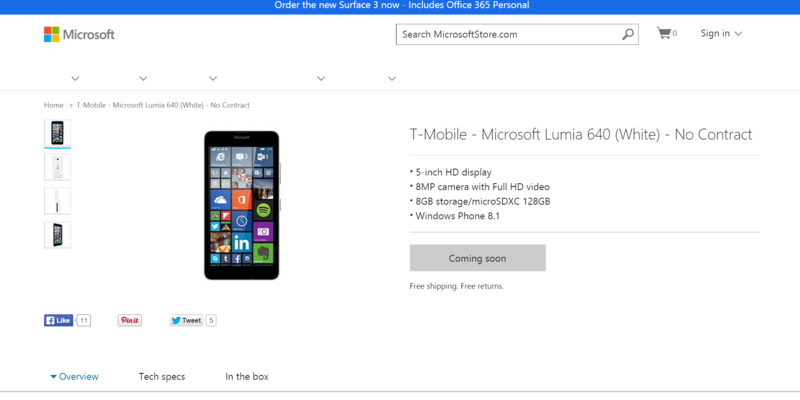 Also, if you search the microsoftstore for 640, the pane on the left will say $50 - $99. So yeah, the price is for real. BTW, just saw that the 640 is hitting the Nigerian and Mexican markets today, LOL. I got an email today from a guy in Nigeria who offered to get me a 640 - all I have to do is give him my bank account number and he'll send the phone "most urgently!" DONE! Boy, I can't wait until that 640 gets here. Sorry for all you suckers waiting for it to show up at AT&T & TMO! etad putta, Nathan-NL and xandros9 like this. Is that guy a prince by any chance? jdballard, Birgitte Sciarretta, FancyFreddy and 1 others like this. I went with the 640 unlocked LTE since its going to be less of a hassle to change carriers and deal with unlock codes. I only paid $209 for mine, though. I'm personally excited about the move to W10. How can I do zooming in my Microsoft Lumia 535 rear camera when photo shooting?